All British Casino – Beware: Christmas Free Spins! Enjoy FS, on the house! Day 18 of the Advent calendar, embrace the festive spirit and enjoy a season of good fortune with All British! With over 500 Free Spins, over £600 in Reload bonuses, one 25% bonus cashback offer on your losses the following day and 3 cash prize challenges worth £3000 available this month, it will feel like Christmas day, every single day. 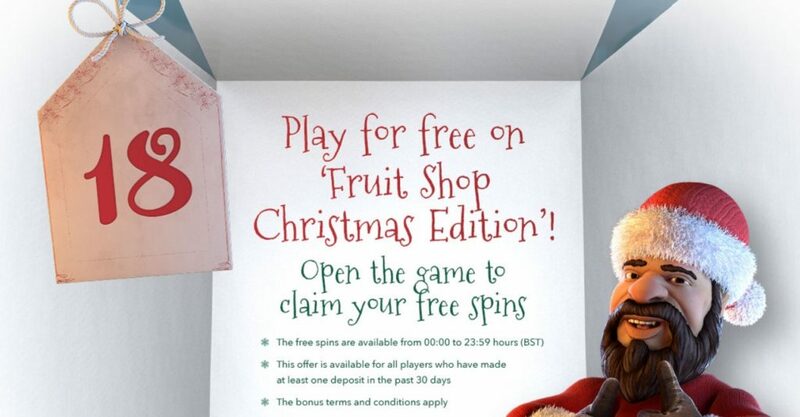 Claim today a mystery amount of Free Spins on Fruit Shop Christmas Edition, based on your activity level and no deposit required. Jolly good times at ABC!